Would be good for a Hockey Line. Not sure how it works for baseball. If only they had those posters from the 1980s and 1990s. Man, I miss those. 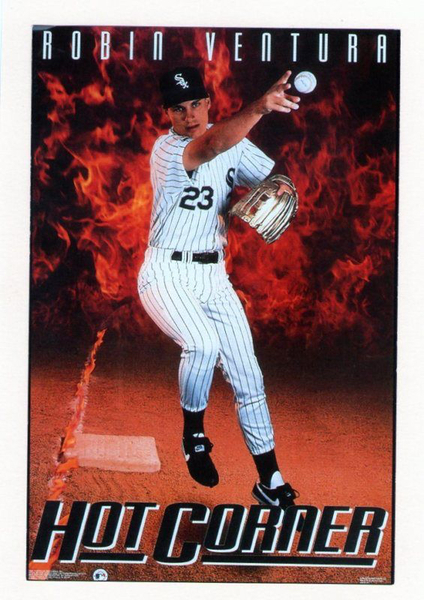 Had a sweet Robin Ventura "Hot Corner" poster in my dorm room at Mizzou. Third base was on fire. It was the height of 1990s chic. Seriously. 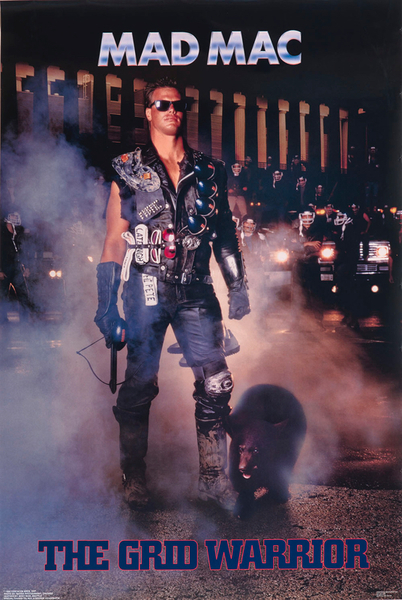 Wouldn’t we have a lot less angst if we still had posters like this in sports? Sorry. Slipped into the Costacos Worm Hole. Name a RF Cardinals could target at trade deadline if the current options are floundering at that point? Matt Carpenter. Go for a third baseman. Because when you start looking around at RF, you end up with a Calhoun and not much else as far as pending free agents. Heyward has that opt-out. Eaton has an option, if Washington is looking to move him. Maybe there's something to the Dodgers wanting to move on from Bellinger, and that's the timing to make that move. I know you're not a huge fan of the prediction game, but if you had to guess, who would you say has a closer 2019 season to their 2017 season: Fowler or Ozuna? As an armchair GM/Medical professional, lower body/foot injuries in 'aging' athletes scare the heck out of me. It's a good question because it does capture the bet the Cardinals are making and the sliding scale that exists with aggregate production -- that is the production the Cardinals get from a group. If they need X production from the outfield and get that number from two positions then carrying a glove in center works better. If they don't get that production from two outfielders, then production from the third has to fill in what's missing. And so on. Teams think this way in team-building. Sure, 1B is a power position, but if that power is coming from 2B or from SS then teams can make a different decision with 1B. And so on. Given their age and health and trend, the good bet is that Ozuna will get closer to his career norm and Fowler will see more power. I'm talking my way through this and it seems like the odds are in favor of Fowler getting closer to 2017 because Ozuna's 2017 remains the outlier of his career at this point. Age is on Ozuna's side. Walk-year for Ozuna. Figure he'll be stronger, more comfortable, and on and on. Alright, let's go this: Ozuna will get closer to 2017 in total. That's still heady stuff. It seems like every winter we're doing articles like that in real-time. As one of the fans not agreeing with batting your best hitter third, my reason is that I've not bought into the launch angle, homer-is-the-only-way-to-score school of thought. If one is playing small-ball, then you want your best hitter up with runners in scoring position, and not just on first base. Alright. I just think a team should get its best hitter up as much as possible during a season. The comment “Post Malone” and the response “Guard Stockton” should be in the Quick Hits. Dear Editor, make it happen. Make me happy. I was rather proud of that one. Niche answer, really. You said the FO won't make a move just because the fans want it. That being said, how much does the FO pay attention to what the fans are saying? How do they go about finding out what they are saying? You think Mo is reading this chat? Hey Mo! Maybe. They say they're aware of the fans. I'm sure they get emails. Mozeliak has maintained at least two Twitter addresses to read Twitter, while not engaging in Twitter. They are aware of what reporters and pundits say on the radio, so I imagine word gets back to them about the fans as well -- or pundits that capture the zeitgeist of the fans. I don't think they're silo'd off from the fans. That is way different than making moves at the whim of the loudest fans. Bumgarner seems like a future Cardinal. If Bum looks healthy, why not Gomber or Ponce for him? Why not indeed? I don't believe anybody said they shouldn't. You suggested that other teams, not just the Cardinals, would refuse to spend a lot of money just because the fans want them too. That doesn't seem to be the case with the Phillies. Their owner seems to have an open vault and says he is ready to spend crazily. Let's spin the wheel: If the Rockies are out of it at the deadline this year, and the Cards are still bubbly, any chance they're willing to ship Arenado to us ahead of his walk year? If so, do you see any package of Carpenter and some mid-high level prospects able to seal the deal? I don't want to toss the farm at Arenado just in case he walks next year, but if you include Carpenter and his option year, keeps the window cracked for Rockies to soft re-build next season around his expiring and then eye 2021 as a full reboot. Then Cards have some PR space to hopefully go full on at both Arenado and Goldy this winter on extensions instead of open market. Whatcha think? Why. Trade. Matt. Carpenter. He. Is. A. Good. Hitter. Until. Two. Months. Ago. He. Was. The. Best. Hitter. The. Cardinals. Had. Seems. Like. The. Kind. Of. Player. Who. Would. Help. A. Team. Stay. "Bubbly." In. The. Standings. Why. Trade. That. Kind. Of. Player. But you can't. Makes no sense for Colorado or the Cardinals. Both teams get less than what they want. Thanks Derrick for the chats. Is the role of chats in the journalism marketplace solely to generate clicks? While it may not matter much for four hours on a Monday, I would think that the chats during the winter meetings for example would have a significant impact on time for reporting. Are the sheer number of chat clicks worth enough to offset a potential missed story or more reporting? I wrestle with this. The chat gets good engagement with readers, and your portrayal of the chat and its traffic is incorrect. One of the best traffic-generators as far as chats go happened on Christmas Eve. So, yeah, "four hours on a Monday" does draw in readers and does draw in conversation and does do the job of engagement with readers in a format that they clearly value and enjoy. That's what matters. That's the content that we're trying to provide -- in addition to the articles, the blogs, the podcasts, the enterprise work, the features, the breaking news. All of it. That's what we do here. Would you leave the stl pd for a job with the Denver post? Is covering the Rox a dream job for you? (I think you do a great job for us. I was just wondering bc my job is considering moving me to CO). That is not my dream job, no. They have an excellent baseball writer. And in Colorado, the Broncos are the Cardinals. I don't take for granted the job I have, where baseball matters so much, or the fact that it allows my wife to live where she would prefer. Those two things -- not in that order -- are important to me. Welcome to my corner of the Internet. We have coffee. I don't know if there is a question here or not. I enjoyed the PD article a week or two ago with Carp enjoying being able to prep for the season knowing he will see most of his reps at 3B as opposed to not really having any idea. I imagine relievers would have a similar feeling about knowing how the 6th, 7th, 8th, 9th innings would ideally set up for the team. I know there are a lot more factors to determine who pitches a given inning on a given day, but I would imagine it would be nice for a guy to know that the team generally likes him going in a certain inning, yet that idea is almost scoffed at by modern approaches to the pen. I will cede that having a guy that can go whenever, for however long and be lights out is nearly invaluable. I tend to agree with your premise, especially after years of talking to relievers. I am willing to allow for the fact that conversations this year could prep pitchers for a different approach, and having a presence like Andrew Miller set that tone will be invaluable, to borrow your word. I think he could set a tone, set an example, and then if success follows -- well, I'm intrigued by the approach the Cardinals are advertising. Where do u think Harper and Machado end up?, In ur opinion. Still has the vibe of Machado to Philly, Harper to Washington, and White Sox frozen out. Harper to Philly is a wrinkle that would put Machado in Chicago with the Sox, it seems. Ken Rosenthal had an interesting story about the Yankees and how they shouldn't be counted out until Machado is fastening the buttons on another jersey. Makes sense. There's a team like that with Harper, too. The Dodgers. I see this team as a likely close 2nd place finish in the division, the Cubs have a lot of good players and Darvish has to be better than 2018. The Cardinals managed 88 wins last year despite some awful injury and performance luck (Molina, Reyes, Fowler, Dejong, Waino, Wacha, etc). Why are so many of our fans not recognizing what a potentially great season we might have in 2019? Injuries can take down any roster, but this team looks pretty solid. I can't wait for warm weather and HOF'er parades. I'm not sure Darvish is a certainty. Hamels is the swingman for the Cubs, to me. He could be excellent and then the Cubs are excellent. If he's OK, then Darvish or Hendricks have to be excellent or that rotation will come undone. Cardinals are precarious when it comes to innings and pitching. They are throwing quantity at the challenge, and that works OK. Certainty would work better. Is Schildt being too positive? To me Mikolas, Martinez and Flaherty are all good #2s. Flaherty has #1 potential. Wacha is a #3 and Waino is a bullpen pitcher. Reyes could be a #1 if healthy I guess. Again, I asked what would you expect him to say? He's backing his players. There isn't a pitch to throw today. He can speak in optimistic terms, now more than really any other point in the year. He's not the only manager to say this about his team. He's not the first. He won't be the last. This is what managers are supposed to say publicly. In what world do the Cards have 5 aces? If you look at fantasy baseball rankings (not as an end all be all), but as a loose guide. You are hard pressed to rank any Cardinals pitcher as top 30. Mikolas, Flaherty and Martinez are consensus top 60. So three #2 SP I guess. They don't. I think we are all astute enough readers to know that. Don't you agree that our society is a little messed up when someone who can throw a baseball over 90 mph or hit one that fast makes millions of dollars a year and a school teacher makes peanuts? Which professional do you think impacts more lives?